With CIA drones buzzing over the mountains of Waziristan and billions of American dollars bankrolling Islamabad as Washington demands that more be done to fight the Taliban, it's hardly surprising that Pakistanis obsess about U.S. intervention. But documents from WikiLeaks' vast trove of U.S. diplomatic cables offer a timely reminder of the machinations of another key foreign player, perhaps even more influential: Saudi Arabia. Some of the documents released last week describe increasingly strained ties between Pakistan and its long-standing Arab ally, with the Saudis particularly disgruntled by Pakistan's President, Asif Ali Zardari. 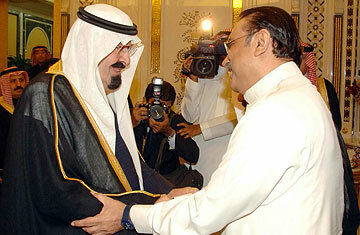 According to a January 2009 cable, Saudi King Abdullah described Zardari as "the 'rotten head' that was infecting the whole body"; other cables suggest the Saudis would prefer Pakistan to lose its weak civilian leadership in favor of strong military rule. Saudi Arabia was a major backer of the military regime of General Zia ul-Haq, which seized power in 1977, embarked upon an Islamization campaign throughout Pakistan and was also a key U.S. ally. But the concern of U.S. diplomats was not confined to Saudi Arabia's dim view of Pakistan's government. A December 2009 secret cable signed by Secretary of State Hillary Clinton called Saudi Arabia "a critical source of terrorist funding." And that had a direct bearing on Pakistan, since it alleged that much of the financial backing for jihadist organizations in Pakistan continued to originate in Saudi Arabia, despite Riyadh's efforts to cut down on private donations to Sunni militant groups abroad. Analysts have long observed that conservative madrasahs set up across the country with Saudi backing have helped spread a puritanical and intolerant brand of Sunni Islam that helps fuel the militancy that plagues Pakistan today. But the leaked U.S. cables also allege that extremist groups operating on Pakistani soil, such as al-Qaeda, the Taliban and Lashkar-e-Taiba (LeT) "probably raise millions of dollars" each year in Saudi Arabia. An August 2009 cable points to a Saudi-based front company that LeT likely used to pool and move its money. Washington has urged the Saudi government to shut down its local sources of terrorist funding  and the leaked cables report positive steps in that direction  but Riyadh clearly lacks the means to totally turn off the tap. But Pakistan's struggle with militancy has not altered Riyadh's low opinion of President Zardari, whose key political rival, the more religiously conservative Nawaz Sharif, spent eight years in exile in Saudi Arabia as a guest of the King. The cables chronicle Saudi complaints over Zardari's alleged corruption and incompetence but also suggest a pronounced sectarian bias on the part of the Saudis, who perceive Zardari to be a Shi'ite and therefore friendly with Iran, Saudi Arabia's nemesis. According to a U.S. cable issued soon after Zardari's election in 2008, Pakistani diplomats complained to their American counterparts of "a sharp reduction in Saudi financial assistance." One official is quoted as saying that the Saudis are simply "waiting for the Zardari government to fall." While voicing support for Sharif, it seems the Saudis, according to the cables, wouldn't object to the military's resuming control. A February 2010 "scene setter" for a visit to Riyadh by Richard Holbrooke, Washington's special envoy to Afghanistan and Pakistan, suggests Saudi nostalgia for the government of General Pervez Musharraf, whose near decade-long rule ended in 2008. "The tumultuous democratic process in Pakistan makes the Saudis nervous," says the document, "and they appear to be looking for 'another Musharraf': a strong, forceful leader they know they can trust." Riyadh may well have come to see its best hope in Pakistan as the current army chief, General Ashfaq Kayani. A May 2009 cable relates a discussion between Holbrooke and a Saudi minister who lauds Kayani as "a decent man" and describes the Pakistani army  which has ruled Pakistan for long stretches of its six-decade history  as Riyadh's "winning horse" in the country. That's not surprising. In the 1970s and '80s, some 15,000 Pakistani soldiers were stationed in the deserts of Saudi Arabia defending the kingdom's borders, and in subsequent years the Saudis have provided significant monetary and technological assistance to the Pakistani army. Despite the tensions with Zardari's government, military and intelligence links between Riyadh and Islamabad remain strong and close  so much so that the U.S., for all its presence in the region, still leans on Saudi Arabia for counsel and support. The cables, says Rafiq, "demonstrate that the Saudis have deep vested interests in Pakistan and an influence that is so significant that even the U.S. in some way relies on Saudi knowledge of the country."